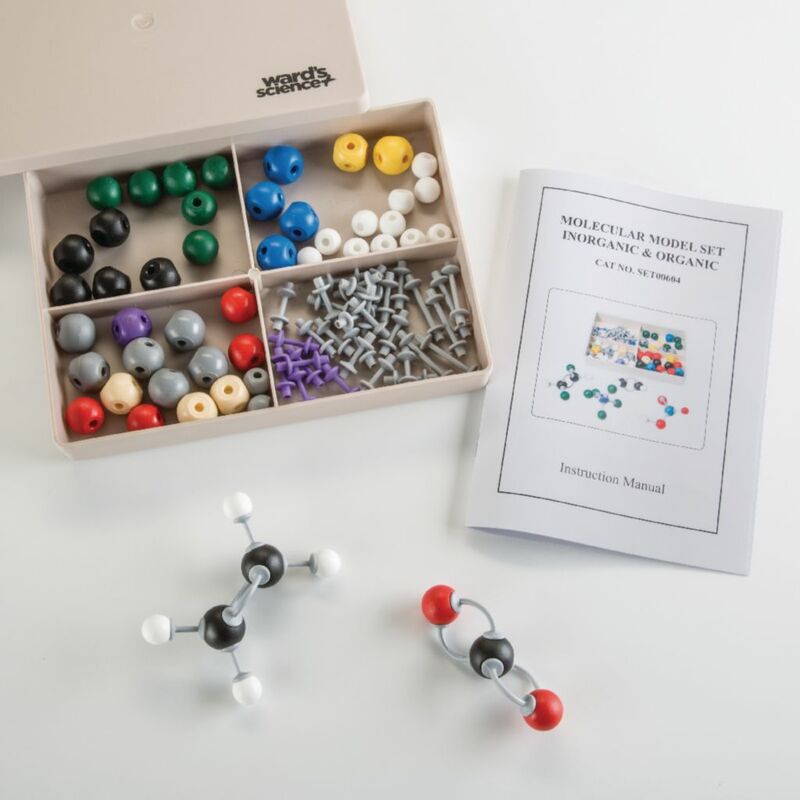 Students can now construct both inorganic and organic chemistry structures with one comprehensive set. In addition to common organic molecules, this set allows you to build metal oxides, hydroxides, non-metal oxides, hydrides, and halides. The complete set with instructions comes in a convenient plastic storage case. Ordering information: 6 carbon black and 4-holed 22 mm atoms, 14 hydrogen white and 1-holed 22 mm atoms, 2 nitrogen blue and 4-holed 22 mm atoms, 6 oxygen red and 2-holed 20 mm atoms, 1 sulfur yellow and 2-holed 22 mm atoms, 1 sulfur yellow and 4-holed 22 mm atoms, 1 sulfur yellow and 6-holed 22 mm atoms, 1 phosphorus purple and 5-holed 22 mm atoms, 6 halogen green and 1-holed 20 mm atoms, 3 metal grey and 1-holed 15 mm atoms, 3 metal grey and 2-holed 22 mm atoms, 2 metal grey and 3-holed 22 mm atoms, 1 metal grey and 4-holed 22 mm atoms, 1 brown and 4-holed 22 mm atoms, 1 brown and 5-holed 22 mm atoms, 1 brown and 6-holed 22 mm atoms, 25 medium links, and 10 long and flexible links.